V.K Gupta, is an Engineer by qualification form Delhi University and did his graduation in Engineering form a very well known Engineering College – Delhi college of Engineering in 1972. He has been associated with cable industry throughout his entire carrier. Presently he is Director (Marketing) in a well-known cable I Industry known as CMI Limited, an industry manufacturing wide variety of cables since 1977. He is also Director in another associate company CMI Energy India Pvt. Limited. M/S CMI Energy India Pvt. Ltd was earlier known as M/s General Cables of USA, A fortune 500 company & CMI has acquired its stakes in India, The two companies are manufacturing wide variety of cable- Control, instrumentation, Rubber, Floropolymer cables and LT /HT power cables up to 66 Kv. And serving to various service sectors in the country. The total turnover of the group is app 400 Cr. Mr. Gupta is well-experienced person having almost 45 years of experience in cable industry. The topic selected by him to speak today is : Cables- Types, Specifications, Manufacturing & Marketing”. He is going to discuss various aspects of the topic in detail from his experience. We sincerely hope you all will be benefited from his experienced talk. He has also displayed some different varieties of cables for you to understand. 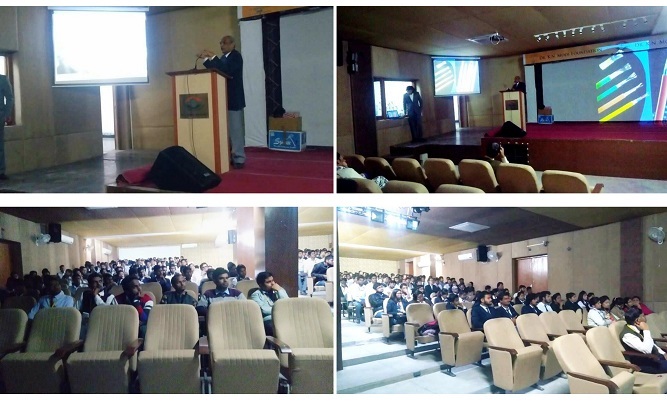 Seminar was attended by : Students and Staff of Management Department, Mechanical Engineering and Diploma, Electrical Engineering and Diploma and Civil Engineering. Welcome Speech was given by the HOD of Management Department Dr. Arun singhal and the felicitation of the guest was done by HOD Mechanical Engineering Dr. Manvijay Sir. The session was quite enlightening for all the students as the speaker gave all the possible specificatons of the products manufactured by their company and also guided the students in the manner of doing work in the field of cables and wires (energy) Sector.